Following the release of the N580GTX-M2D15D5, the fastest single GPU graphics card in history, world-renowned mainboard and graphics card maker MSI today unveiled the second member of the GeForce 500 series, the N570GTX-M2D12D5 graphics card. Using NVIDIA's latest 40nm process, the MSI N570GTX-M2D12D5 features a 480 CUDA core GeForce GTX 570 GPU, support for DirectX 11, and NVIDIA 3D Vision Surround technology. 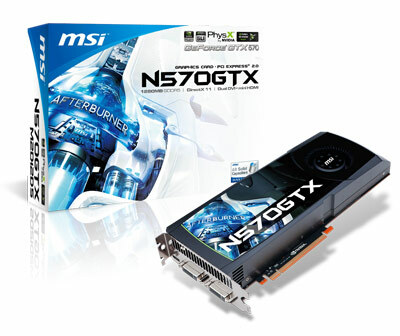 In addition, it also features high-speed 1280MB GDDR5 graphics memory, which puts t on the same level of performance as the champion of the previous generation, the GTX 480. GPU overvoltage is supported via MSI’s award-winning Afterburner software. In addition, a purchase of select N570GTX-M2D12D5 graphics card with 3DMark 11 packaging or with a 3DMark 11 sticker on the package right now will include one free 3DMark 11 Advanced Edition coupon! Not only do you get to fully experience the ultra-astonishing effects of DirectX 11, but you can also upload your scores to compare the performance of this powerful graphics card with other gamers! By using the MSI exclusive Afterburner overclocking software, users can adjust GPU voltage to unleash the overclocking potential. With the advanced fan control function, users can control the fan speed during operation to ensure stable performance. Furthermore, the burn-in stability text – Kombustor - can help users to monitor the overclocking conditions. MSI, the official mainboard and graphics card partner of 3DMark 11, is celebrating the official release of 3DMark 11, with a special promotion that provides a 3DMark 11 Advanced Edition Coupon inside select N570GTX-M2D12D5 graphics cards with 3DMark 11 boxes as well as packages specially-marked with 3DMark 11 stickers*. Gamers can download the free edition on the official 3DMark 11 website and enter MSI’s advanced edition activation code to access 3DMark 11 advanced edition functions. Not only will you get to experience the astonishing effects of DirectX 11, but you will also be able to upload your own system performance and compete with other top gamers online!